Looking at pointillism today as design inspiration. Georges-Pierre Seurat was a French Post-Impressionist painter and draftsman. 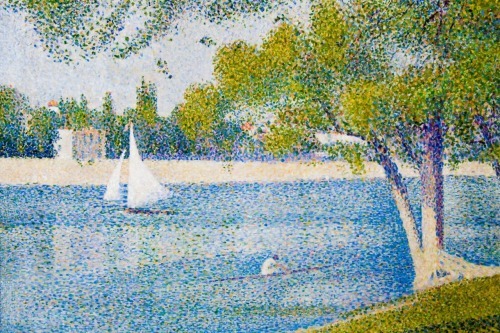 He is noted for his innovative use of drawing media and for devising a technique of painting known as pointillism. His large-scale work A Sunday Afternoon on the Island of La Grande Jatte (1884–1886), Seurat's most famous painting, altered the direction of modern art by initiating Neo-impressionism, and is one of the icons of 19th century painting. Greetings, super job, basically wasnt so busy with my searching I just read your full weblog. I ought to say i've to express gratitude!